W L Watson and his father employed as exploration drillers on the deep leads of Victoria in pursuit of alluvial gold. Business interrupted by WWII and the massive decline of gold prices. Post war W L Watson’s attention shifted to the water contained in ancestral riverbeds and countless bores for stock and domestic purposes. 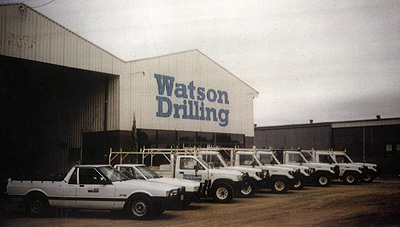 Under John Watson (son of W L Watson) Watson Drilling grew into central Victoria’s leading alluvialdrilling contractors including gold exploration. 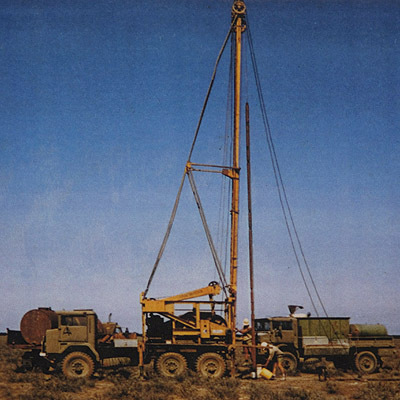 In the late 1980s Watson Drilling focused its attention to the little explored deep ground water basins of southern New South Wales. Established a permanent base in Deniliquin in 1988. Growth and modernisation of fleet with heavy-duty rigs being purchased to undertake the greater depths and larger diameter holes required. Added electric and gamma logging equipment to help identify the potential of aquifers. Full test pumping equipment being added to the fleet, enabling pump testing from ½ litres per second up to 300 litres per second out of the various size pumping units. Pioneered many techniques of drilling and constructing practices that went on to become the industry standard, including the insertion of large diameter PVC pipes into irrigation bores. Re-entered resource sector with significant uranium, coal, heavy minerals contracts throughout mid – Eastern Australia. In 2007, awarded Business of the Year award by the Deniliquin Chamber of Commerce. Further modernisation of drill rig fleet comprising of various configurations, giving Watson Drilling the flexibility to tackle drilling tasks of all dimensions from 50mm to 500mm and capable of working in most geological conditions throughout Australia. From 2007 11 new heavy duty multi purpose rigs delivered adding to our current fleet.